We all have a general idea on how tough some removals can be. Nobody wants to be in a situation where odd objects need to be delivered. Even professional movers have their wishes but unfortunately nobody asks them and thus they are forced to relocate even the strangest goods. What we decided to do is have some of our professional workers share some of their unusual experiences when it comes to delivering goods. Instead of just listing possible crazy items we took some information straight from the horse’s mouth. We will share with you some of the stories our movers told us regarding taking care of some interesting items. Although some of it might sound a little funny, we assure you that this business is no joke. 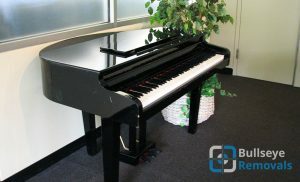 For example one of our colleagues shared his experience during which he was part of moving a piano for an old lady in London. He said that it went exactly how you picture it. In many movies or cartoons you can see a piano tied to a rope being lowered down the balcony. This instance did not make a difference as the pieces were too big to fit through the door. According to his story a pulley was needed as the apartment was located on the 3rd floor. Even though the distance doesn’t look like it is big, it actually is not something to neglect. The piano weights about 600 pounds our mover says. It was funny to him that a few guys stood on the ground underneath as they lowered the piano to make sure it doesn’t fall. It’s not like they could have caught it, but that’s human nature I guess. Another one of our movers told us that he had an interesting time moving a fish tank. It was quite a big one as its volume was 200 litres. The “fun” part according to him is the shape of the thing. It was round and the workers were initially befuddled as they were not sure how to approach this moving task. Taking it apart is of course not an option so they called extra help. Thanks to the fact that our moving company has plenty of manpower they were able to smoothly move the tank. What they did was carefully lift it on one side and roll it down onto a moving trolley. Luckily the company also has top class supplies and good variety of them because the trolley was large enough to accommodate the tank. A Luton van wasn’t big enough for it but a flatbed lorry along with safe packaging and plenty of straps came in handy and the fish tank was safely delivered. This is what we call a professional removal job. A third employee of ours talked about a job which isn’t special at first. They had to move 300 bags of cement during a commercial move in London. The special part is that the bags are paper made and even the slightest bump can break them and render them useless thus leading to losses for the company.